Most regular readers know by now that Im not a huge fan of the flat bench press. But I do like having big barbell movements in the program as indicator lifts. The low inline press, with the bench set to somewhere between fifteen and thirty degrees was a favorite chest exercise of six time Mr. Olympia, Dorian Yates. This variation hits the pecs more effectively and is less stressful on the shoulder. 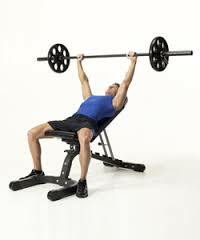 Even better is the low incline press with the Swiss Bar. 25 Ways to Keep Doctors Away .